It’s almost Christmas and if it weren’t for the darkness and the light decorations everywhere you would hardly be able to tell. The weather doesn’t feel like winter at all. Just last week it was 15.3C where 5.4C is normal making it the mildest 17th of December on record. No wonder when it was almost 10 degrees C warmer than usual. Several people reported daffodils blooming in Amsterdam! Very unusual for December and very unwanted I would think. Global warming is undeniably here. But I am sure that you, my readers, and I, are doing all we can to stop that warming by cycling as much as we can, even in these dark days of the year. But that is also weird: I haven’t yet used my gloves this season! 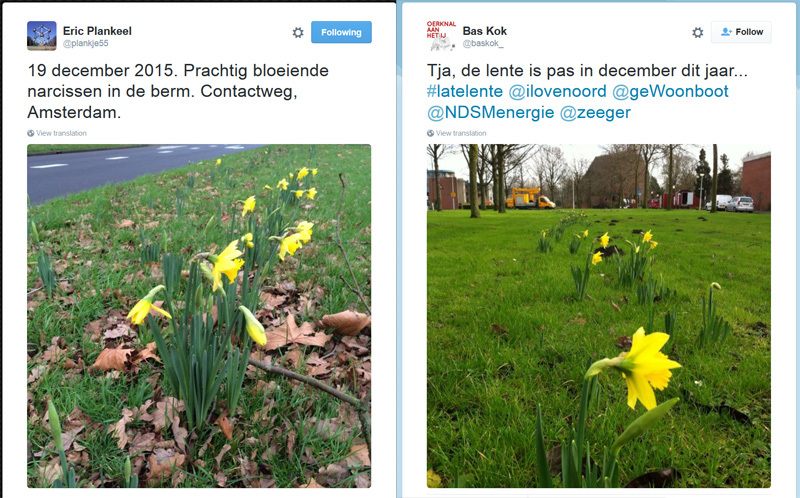 Daffodils blooming in December, in Amsterdam as reported by Eric Plankeel and Bas Kok. And not only in Amsterdam, also in Bournemouth. I have made it almost a tradition to film people cycling in the dark with a backdrop of Christmas lights all over the Netherlands around this time of the year. Three times in a row already. I wasn’t sure if I should continue, but I did give it another go. This time though, while I was filming in Utrecht, I saw that the number of people cycling was enormous. The footage I got didn’t feel like a romantic Christmas video at all, this had to become a Holidays Bicycle Rush Hour video! Happy Holidays! | Fijne Feestdagen! This year’s Happy Holidays video! Next week I will publish a round-up video with all the posts and videos of the entire year in a little over 7 minutes. It will give you the opportunity to see if you missed anything. So even though many of you will have a holiday break, I do hope you will come back next week to visit that final post of the year! 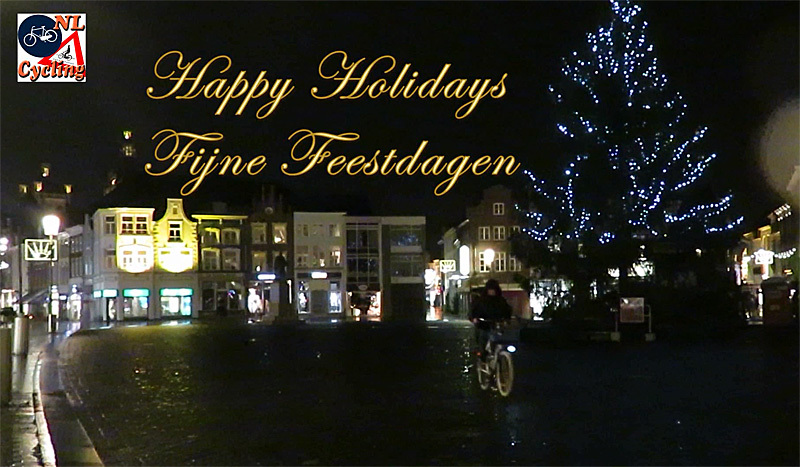 Until then I would like to wish you all Fijne Feestdagen! or Happy Holidays! just as a cold day does not disprove global warming, neither does a warm day prove it.it is the long-term slight variation in climate that provides the proof. And yes, we have recorded numerous years recently that are the warmest on record. An excellent book is A Matter of Degrees by Gino Segrè. It is not on the subject of global warming but in one portion discusses a detail list of the various components that go into determining the temperature of the earth. Read it and see what you think then. In Poland +10*C (should be around -5), no snow :(. I like ride on the bike when is snow. Happy Holidays! Great blog and good that you write it in English (I do not know Dutch, but I really like your country). Merry Christmas Mark! Thanks for another great video and story from The Netherlands. And Merry Christmas to all in the bicycledutch community! It’s quite warm here in Minnesota as well. We usually have a white Christmas though about 15% of the time we have a brown Christmas. This is a rare (roughly once every 70 years) green Christmas. Down under in what was once “New Holland” (Australia) it’s also much warmer – on and off the bike with the New South Wales government the latest to declare a full-on “war on cycling”. This is *after* we had an official heatwave last week that included 4 days in a row of 40+. The poor old made-in-NL mass-produced supermarket stroopwaffels cannot cope with the heat during transit and come out of the pack “glued” together by re-melted syrup. Still yummy though, and always a reminder of my time cycling in the Netherlands in 2013, as is your blog Mark. All the best for the season and may it get cooler for both of us in the New Year. Yes, I heard the news on the war on cycling in New South Wales. $319 dollars for cycling without a helmet. A few of those and the cost could have instead flown you to NL to cycle there stress free with the wind in your hair. Here in Queensland, I carry a medical certificate to ride without a helmet. Looking forward to returning to the NL for another cycling tour next summer since Australia doesn’t have the demand for building adequate cycling infrastructure. Hmmm, I wonder why? That makes logical sense. You are in the southern hemisphere. Also Australia normally for thousands of years has had this warm climate. Good video. Merry Christmas from Australia. It’s +28 C in Brisbane today. Here’s wishing a very Happy Holidays to you and yours! I have really enjoyed your videos and have learned a lot from them. I look forward to following your postings again in 2016. The Dutch are an amazing people. I admire them very much. 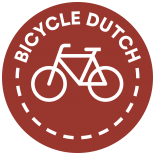 You are an excellent ambassador for the Dutch and for cycling! Keep up the good work!! And the music choice, I thought with the more electric guitar sounds that it was going to be a rap version of Silent Night. Big contrast with the in my opinion, more aesthetically pleasing piano part. If aesthetics could be applied to music. Do you think it is a good idea for people to learn how to drive? And if so, any good ideas about how to make it as eco friendly as possible, and good tips in general for learning to drive if you agree with it? And wow, +10 C, I wish it was only -10 C in my city, where now it often goes in the -20s or so. It was quite mild up until about late November though. This entry was posted on 22 December 2015 by Bicycle Dutch in Original posts and tagged dark, rush hour, watching people cycling, Winter.